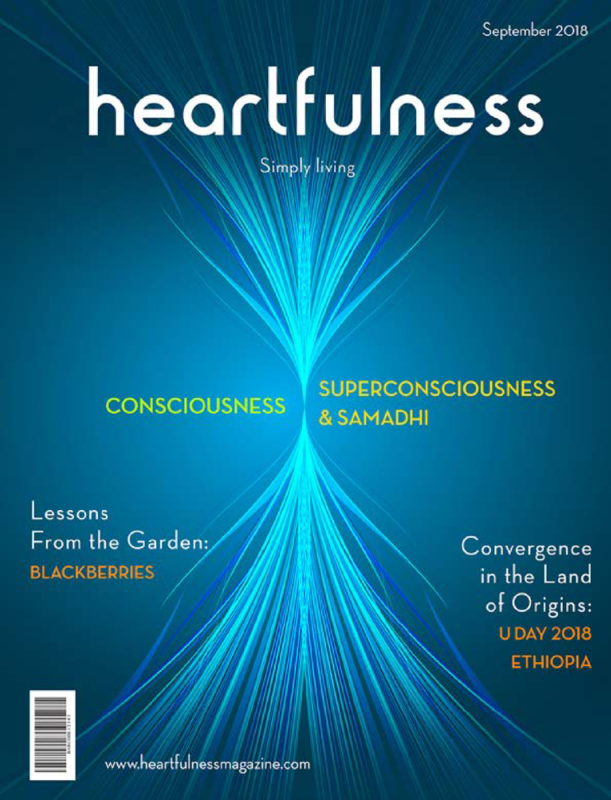 In this issue, our writers explore questions about human evolution and consciousness, including the final article in the Ashtanga Yoga series on the eighth limb, Samadhi, the topic of ‘Who Am I?’ and synchronicity. We bring you Daaji’s interview by the hosts of Spirit Matters Podcast, Dennis Raimondi and Philip Goldberg, and also the concluding part of the interview with French artist Fabienne Verdier. There are articles on fear and grief, the benefits of reading, and another inspiring lesson from the garden. Heartfulness 44 The Challenge of Our Time FRANCOIS BOUDERLIQUE shares with us his journey of discovering meaning behind the challenge of our time and how he finds the Gift in any challenge. Patience September 2018 69 T he blackberries are abundant this year and they’re ripe for picking. At least they appear to be. Tey challenge me more than any other berry in the garden for where black and red currants gooseberries blueberries and raspberries reveal their ripeness with color blackberries don’t. Tey are masterful at appearing ripe when they aren’t their glossy black nubs fooling me over and over. My sense of sight is deceived and I must rely on touch – giving the berry a light tug such that if it comes free into my hand it’s a yes and if it doesn’t it’s not ready. Using my sense of sight with other berries I can reach between stems and branches to pick ones that don’t deceive I’m not disappointed. With a blackberry I fnd too often that my efort to get to it has been for naught. My slight tug meets resistance. I notice my impulse to pull it from the stem anyway to give just a bit more force to my tug so it will release even though I know it won’t be sweet and the taste will be undeveloped. But sometimes I’ve reached between a lot of branches for just that berry. I don’t want to have to come back to the same one tomorrow or maybe again the day after that. Over and over I keep fnding berries that are not quite ready. But I fnd impatience too wanting what isn’t ready to be so because I don’t want to have to do it again. Te willingness to accept a situation that is given not trying to force my will on the way things are: I value this I aspire to this. At least I tell myself I do. But in just a simple task like picking blackberries I meet displeasure with a thin coating of irritation to go along with it because it’s not the way I want it to be. “It is out of the dailiness of life that one is driven into the deepest recesses of the self.” But going into the deep recesses requires a willingness to go there to value it. For certainly we live in a world that offers a banquet of distractions from the exploration of inner learning. Patience Heartfulness 70 I could pretend otherwise. No one but the blackberries and I would know. But these are the situations where what I believe about myself and what is revealed through my actions meet. If they don’t match there’s something of. My actions tell the truth. Wasn’t it Goethe who said “To know and not to do is not to know at all” If I’m acting one way and telling myself I value something that doesn’t match well I guess that’s hypocrisy. It’s good to look at it good to name it. Not to indulge in self- condemnation about being a loser. But also not to ignore what blackberry-picking is teaching me. In this quiet context of garden work I have the opportunity to catch thought patterns and habitual responses that I don’t notice in the busyness of daily life. Blackberries aren’t pointing any fngers of blame but they are giving me an opportunity to learn. Catching a pattern here in the garden allows me to recognize it when the same one turns up in more emotionally charged or busy situations. When I fnd myself irritated at the slowness of the driver ahead of me or at the woman in the checkout line having a leisurely conversation about her kid’s preschool when I have a ferry to catch and am about to miss it. If I’ve already looked at my behavior in the gentle atmosphere of berries I can more easily remember: “Hey I know better choices of what to do with my thoughts. I know how to use my attention when waiting in line.” Te poet Stanley Kunitz once said “It is out of the dailiness of life that one is driven into the deepest recesses of the self.” But going into the deep recesses requires a willingness to go there to value it. For certainly we live in a world that ofers a banquet of distractions from the exploration of inner learning. Te question “Why would you want to do this kind of self- refection” brings a furry of voices internalized through the years from who knows where. “Yes why spend your energy looking at your thoughts like this questioning your motives your actions I mean it’s depressing. Te more you look the worse you get. Just get on with your life and do your best and don’t get pulled into this endless navel-gazing.” Hearing these voices reveals the point. If I don’t do this work don’t determine which voice which desire which concept or which attitude is pulling the strings of my choices then I’m acting out those voices unconsciously being “The unexamined life is not worth living” is often attributed to Socrates. For him understanding motives and making choices based on conscious thought made life worthwhile. I can find these deeper learnings in the quiet of berry- picking. Patience September 2018 71 pulled in a marionette kind of life. “Te unexamined life is not worth living” is often attributed to Socrates. For him understanding motives and making choices based on conscious thought made life worthwhile. I can fnd these deeper learnings in the quiet of berry-picking. In Kundalini Yoga for the West: A Foundation for Character Building Courage and Awareness Swami Radha questions the aspirant: “What is the purpose of your life What makes your life worth living” Tese questions felt too huge right at the start when I frst met them as a much younger woman. But really this examination is foundational for building a life of awareness of meaning. It’s essential to examine deeply. Blackberries too encourage awareness if I choose to observe and listen. After all what is this wanting to pick them before they’re ripe Do I know better than the plant Tugging at them trying to force them when it’s not their time. Can I surrender to what is without trying to force my will upon the conditions I am being shown where I do not accept what is but rather how I want it the way I want it. I have all the right reasons. I’m a busy woman lots to get done value efciency. But justifcation with words to make the world what I want it to be is a misuse of speech. Arranging my words to justify my actions and thoughts to tell myself this approach is just fne is an even greater misuse of speech. So I come to the blackberries again bucket hanging from my waist with the intention to accept them as they are letting go of ideas of how I want them to be. Tey are good teachers like Swami Radha and Socrates reminding me of my ideals and gently revealing how to align them with my actions. September 2018 73 Q Speaking about your innovation in style and designing brushes we fnd this new dimension in the Roland Garros 2018 poster that was recently unveiled. FV I tried to catch the ball. It was difcult and I started again and started again. Tis approach of bringing art and sport together was fascinating. Q And your painting evokes the strength of intention in great sports people very well. AWAKENING DYNAMIC IMAGINATION An interview with Fabienne V erdier – Part 2 FABIENNE VERDIER is a French painter who creates unique and fascinating work. Having received international recognition her work is exhibited in large public and private museum col- lections. At the age of 22 she flew to Sichuan China a remote region close to Tibet where she met the old Chinese masters and learnt calligraphy the millenarian art of scholars. And now with a single brushstroke she has created a new universal pictorial language. Here we continue with her interview by the passionate art historian and consultant DÉBORAH FEST KINDLER. FV It’s a game of the mind. A marriage between inner discipline intellectual understanding and spontaneity. Moreover this merging of art and mastery comes from India. Q So every time you design a new tool new energy arises on your canvas. And recently your visual research seems to have gone even further into abstraction notably in the Walking Paintings in which you seem to have a very material relationship with the painting and experience a real melee with the material. Originality Heartfulness 74 FV I now work on the very surface of the canvas. I took the leap to be in the chaos of matter in the great river of the world. For questions of physical constraints I had to create another lighter tool in order to handle it better. While doing tests on the ground as I was moving through space I saw a new energy that materialized in the form of circles. Te great masters say that everything is born of the circle but it is still difcult for me to understand I realize that when these circles of paint burst onto the canvas they create forms of the world like arborescence lines of lightning. Tis way of creating was so spontaneous and so strong that I became scared. It was so much at variance with the teaching I had received and the traditions of the literati. I was afraid of such force. And since I am against force that destroys I did not know what to do and so I put this work aside. It was on a winter’s day in front of the frosty branches of an apple tree feeling a vital boost in the vegetation that I became aware of the work I had done. Q As if the gesture had preceded the thought FV Yes and I would love to work on this with neuroscientists. Q In your book Passagère du Silence you talk about the attitude of the heart in the act of painting. FV We never dare to speak of love but if I am so hard on myself and lock myself in it is the voice of the heart that speaks. Q You also quote a sentence from Kandinsky saying that the artist must be blind to the recognized or unrecognized form deaf to the demands and desires of his time. His eye must be directed to his inner life and his ear strive towards the voice of inner necessity. Do you still identify with this FV Yes completely. Tat’s what makes art difcult and why I don’t relate to any trends of contemporary art. I prefer my small solitary path. Q Indeed on the contemporary art scene you may be perceived as a UFO. You are one of the few artists to speak to us about metaphysics intuition movement breath inner life and what painting can bring to the eye that contemplates. FV Yes and intuition is fundamental. Tere is a lot of work to be done in current teaching on the question of the keenness of intuition. Moreover on the contemporary scene there is almost no painting. I am very disappointed in what I see for example these generations of artists who produce numbered editions for money. Will money and the market destroy everything Painting is also an ethic. We defend a principle and we must feel it on the canvas. Painting is a whole state of mind it is the whole being that expresses itself. And unfortunately a lot of the painting that is expressed today is of great violence. Painting is also an ethic. We defend a principle and we must feel it on the canvas. Painting is a whole state of mind it is the whole being that expresses itself. Heartfulness 76 what we’ve learned to go beyond knowledge to go beyond the boundaries. More and more I go outside the studio. After 40 years of work in a terrible solitude I feel that I have to come face to face with other realities. We have so much to learn from each other. My approach through my work on the American abstract expressionists the Flemish Masters the musicians of the Juilliard School in New York and also the meeting with the great linguist Alain Rey who gave us an extraordinary experience on the energy of the word and of the world all fow in this direction. Q You are constantly experimenting and seem to be always expanding your comfort zone. And when we observe your works we discover a great unity a kind of universality. Tere is also the fullness and emptiness you are talking about. FV Yes these are paradoxes. Te further I go the more I realize that the void is the infnite form. Q Tere is silence too ... F V Yes I have spent my life digging silence and realizing that it is full of the activity of a thousand and one forms of whispering. I am stunned after all these years of work to see everything that can emerge from silence just as everything emerges from the void. It is difcult to convey. PURNA TITALI ASANA SERIES Butterfly Posture Heartfulnes Yogasanas Stage I Sthithi Come to Dandasana Sit erect with your legs stretched forward and heels together. Keep the spine neck and head erect. Place the palms on the foor by the sides of the thighs. Gently close your eyes. Sithila Dandasana: Sitting Relaxation Posture Sit with your legs stretched forward and feet apart. Slightly incline the trunk backward and support the body by placing your hands behind and fingers pointing backward. Let the head hang freely behind or rest on one of your shoulders. Gently close your eyes. Stage II Purna Titali Asana Sit in Dandasana. Fold both the legs join the soles and keep the heels and toes together. Pull the legs inward by drawing the heels closer to the body. Interlock the fngers to hold the toes. Keep the trunk and head straight. Gently push the knees of both legs towards the ground until they touch the ground. Release the legs and move the knees upwards. Repeat this movement of the knees up and down as if fapping wings. Accelerate the movement flap higher and try to touch the ground with the thighs. Keep the eyes closed and do the practice with normal breath for a minute. BENEFITS This Asana is very good for bringing mobility to the hip joints. Prepares the legs for Padmasana and other meditative Asanas. Relieves the inner tension of thigh muscles. Removes tiredness from long hours of standing and walking.